Shirts With Random Triangles: Tennessee Posts Video Of The Start Of Spring Practice. Tennessee Posts Video Of The Start Of Spring Practice. 'Tis the season for spring practice hype videos. 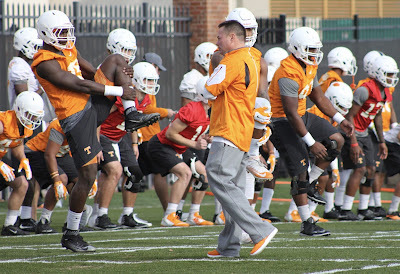 This brief clip if from Tennessee, showing action from the Vols' first day of spring practice. Enjoy. Tennessee's 2016 Orange & White Spring Game will be held on April 16.